With its buzzing nightlife, world-class galleries and museums, awesome restaurants and tapas spots, there’s no shortage of things to do in Madrid. And whether it’s grandiose old-school establishments or chic boutique spots, there’s no shortage of hotels either. 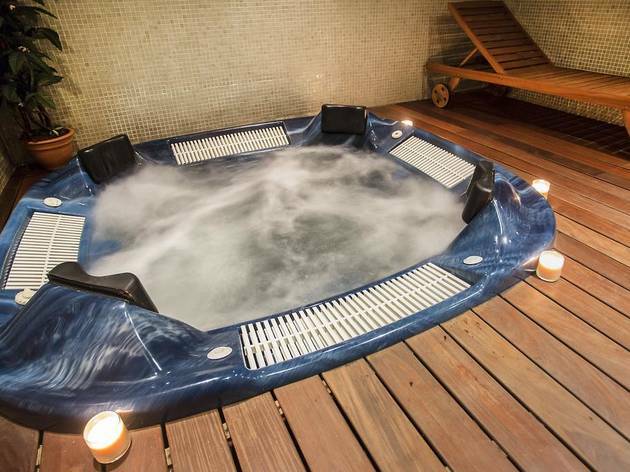 But for many people, the number one priority they have after a day of sightseeing in the blazing Spanish sunshine is retreating into the bubbling, hydrothermal haven of a jacuzzi – preferably with a glass of something in one hand. 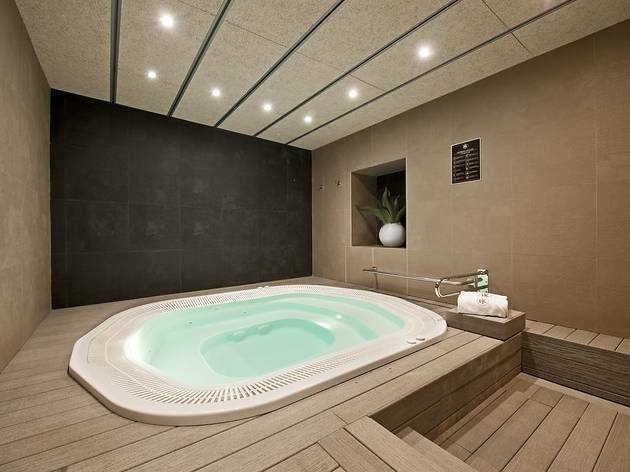 So we’ve done all the hard work, and rounded up the best hotels in Madrid with a jacuzzi. You can thank us later! This hotel is located close to Atocha, Madrid’s principal train station – so is a great choice if that’s how you’re travelling into the capital. The restaurant serves trad Spanish dishes, while a continental buffet breakfast is served daily. But best of all, there’s a terrace on the rooftop where you can relax into a hot tub. Perfect in those warmer months! This hotel is based in the Syv Tower in the Cuatro Torres business area, occupying its lower 31 floors. As you’d expect, splendid 360-degree views of the city abound, not least from the restaurant up on the thirtieth floor. 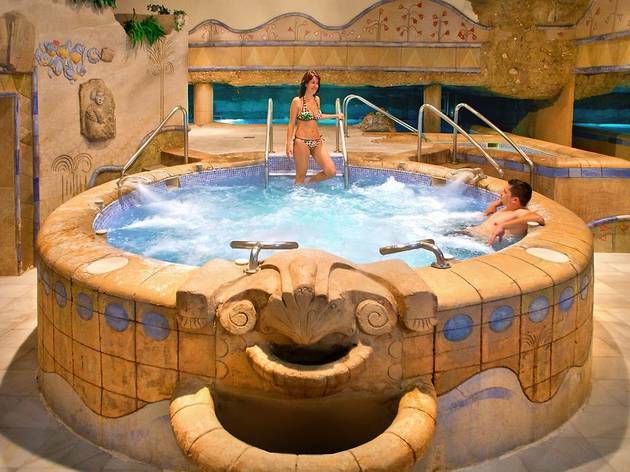 And in the spa and fitness centre, you’ll find a range of water therapy services including a jacuzzi. Go on – you deserve it! Located in the Hispanoamérica district of Madrid, this hotel seems chiefly aimed at businesspeople, with its plentiful conference and meeting rooms. 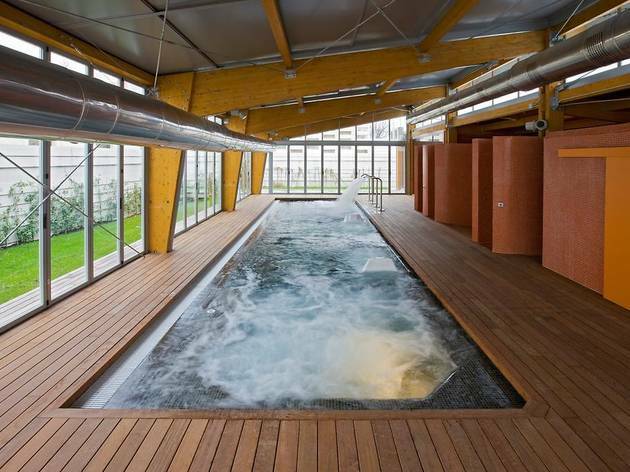 But if you want to drop the business in favour of pleasure for a bit, there’s a pretty swish fitness centre here, as well as pool which has – you guessed it – an adjoining hot tub. 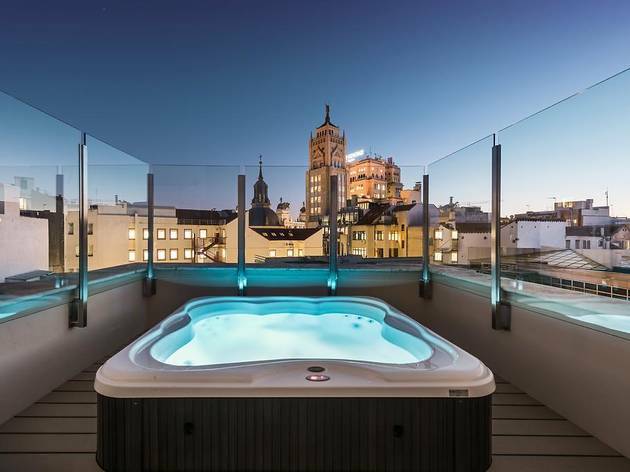 Settle into the rooftop hot tub here, and you’ll be met by some impressive views – the Gran Meliá is little more than a stone’s throw from the Royal Palace, the Royal Theatre and the Cathedral. Inside, you’ll find no end of amenities at this upscale establishment – they include three restaurants, a cocktail bar, a wellness centre and a beautifully manicured private garden. The Hotel Nuevo is located on the northern edges of Madrid, just 15 minute’s drive from the airport, which may well come in handy. (There’s also a free shuttle service into the city centre, if you need to head in the other direction.) Rooms here are crisply, elegantly furnished, each with a minibar, safe and flatscreen television. 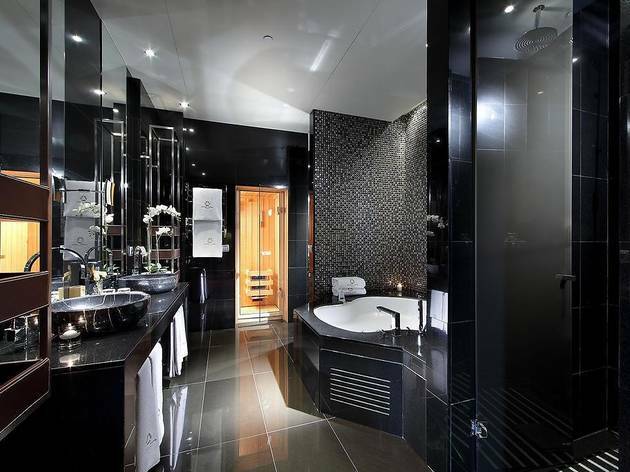 In the cosy, wood-panelled spa centre, you’ll find both a sauna and jacuzzi. The Catalonia Gran Vía is located in a charming and ornate building, built back in 1917, located on the eponymous street that ranks as Madrid’s number one shopping destination. And what else to do after a long, hard day of splashing the cash but head to the roof of this establishment, where you can settle into the bubbling depths of the jacuzzi? 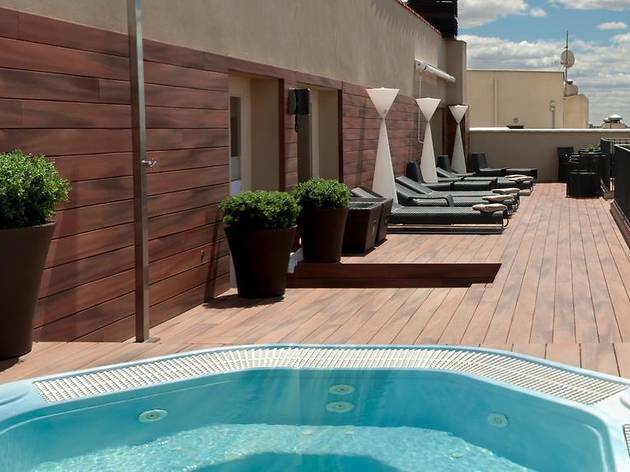 This hotel is located just off the Plaza Castilla, and on the edge of the trendy Salamanca neighbourhood, one filled with high-end restaurants and bars and contemporary art galleries. Rooms at the Exe Plaza are bright, pleasantly decorated and air-conditioned, while the spa centre features a Turkish bath, sauna and hot tub. This design hotel is based in the north of Madrid. 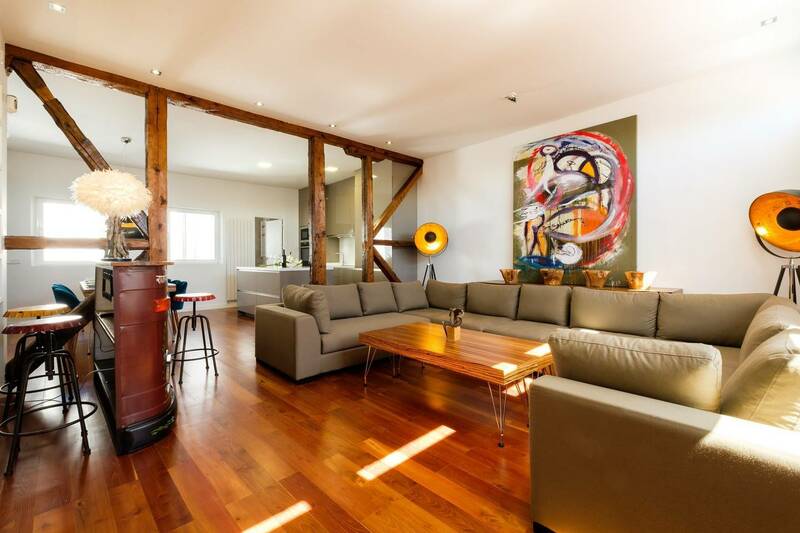 With its colour-block, industrial-esque, it’s surely a contender for the most stylish hotel in the city. You’re also always guaranteed of a peaceful night’s sleep at Las Tablas: rooms here are soundproofed to keep all the hubbub of the city out. 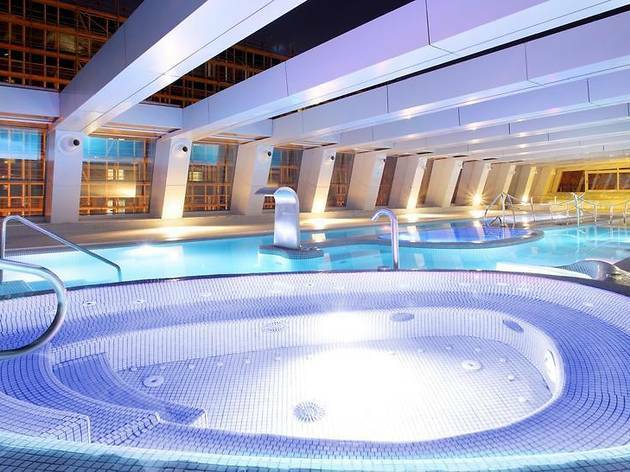 In the wellness centre, you’ll find all the usual amenities, including a hammam, solarium and jacuzzi. 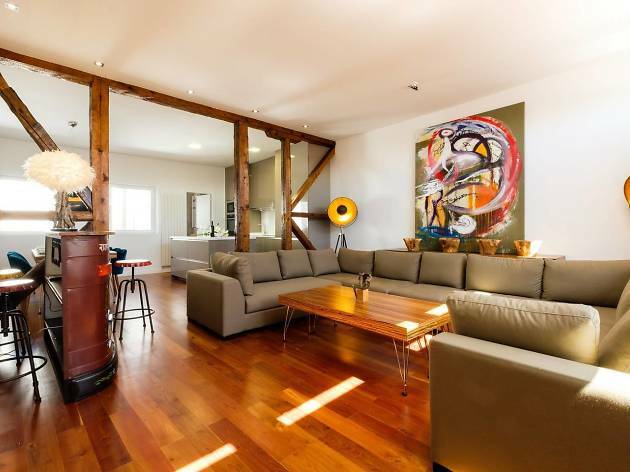 Found slap-bang in the centre of Madrid, the Catalonia is a good choice for those who want to check out the city’s incredible art galleries: the Prado and Thyssen-Bornemisza Museum are both just a ten-minute walk away. Rooms are decorated in neutral tones and each has a flatscreen TV. 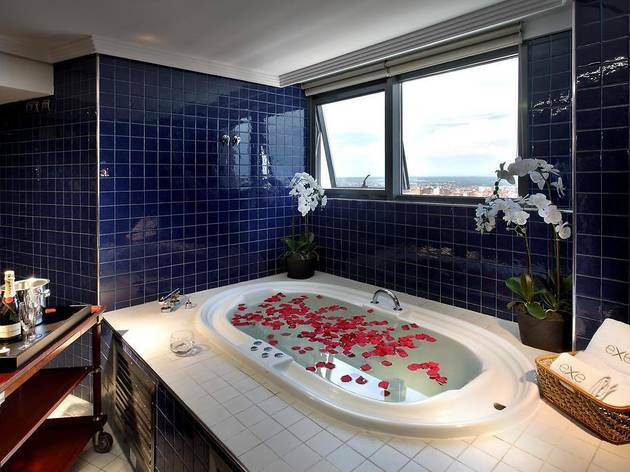 That all-important jacuzzi, though, is to be found in the hotel’s spa centre. 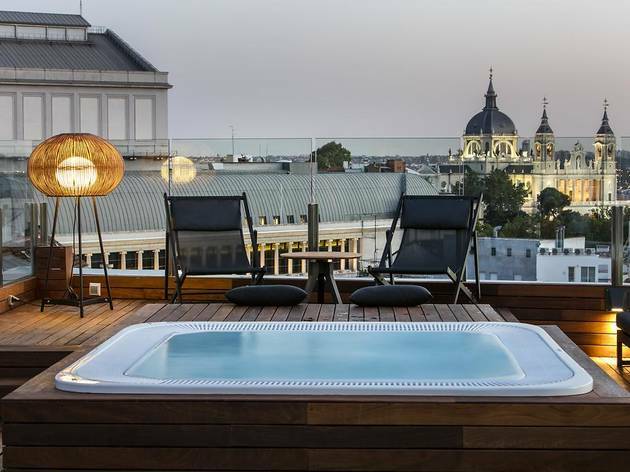 Another hotel on Gran Vía, towards the end located in the Malasaña district, the Senator not only has its own rooftop terrace – complete with hob tub – but also has one serious eye-opener of a spa centre. Decked out with fake rocks and faux-Byzantine decor, it boasts a sauna, Turkish bath and more than one plunge pool. You might feel a bit like a sultan’s concubine when you’re in here, but what the hell!